Did you know you can recycle computers, printers, scanners, cd’s, dvd’s and computer accessories? E-Waste in landfill leaks toxic materials such as mercury, lead, beryllium and cadmium. Many computers can be refurbished and given to charities, community groups and low–income communities. Individual materials are recovered from old circuit boards, cabling, glass and plastic to produce new products. We are all aware of the rising cost of electricity and the shock reality is that your computer monitor is using two-thirds of your PC’s total electricity! The Environmental Sustainably department at Monash University in Victoria now recommends that students and staff switch off their computer monitor when they are away from their desk to attend classes, meetings and go to lunch. Origin Energy’s ‘Office Environment Energy Efficiency Fact Sheet’ recommends you turn off your monitor if you will be away from it for more than 30 minutes. On some computers you can set your monitor to turn off or hibernate when not in use. Modern computers can have their lifetime extended by frequent shut downs – so even consider turning off your computer for those lengthy meetings and definitely at the end of each work day. Remove your Screen Savers. Another energy waster that uses processing energy as well as excess power to light up the screen. Modern LCD screens do not suffer from the burn out that required the original need for screen savers and use roughly half the amount of electricity as a CRT monitor. If purchasing a new appliance for the staffroom, remember the more energy stars the better. When boiling water only fill the kettle with as much water as you need. Minimise water cooler use – use tap water for the kettle or urn and even to refill your glass, or why not keep a jug of water in the fridge. Turn off the office vending machine overnight. Install a coffee machine to save the time spent fetching coffee, to reduce waste and as a nice way to say ‘thanks for all you do’ to your staff. A well-known NASA study in the late 80’s concluded that certain plants improve air quality by filtering out common volatile organic compounds (VOCs). The best plants include varieties such as Peace lily, Aloe vera, Spider Plant, Mother-In-Law’s tongue, Chinese evergeen and even Gerberas. Recently, research teams from Norway and America found that plants in the workplace also improve concentration and productivity. Adding an element of nature to your work space is micro-restorative and falls into the theory of “attention restoration” – the ability for mental fatigue to be restored when we give our direct attention a break. Sleep does this most effectively, but adding an effortless form of engagement to our space, such as nature, also provides the same effect. 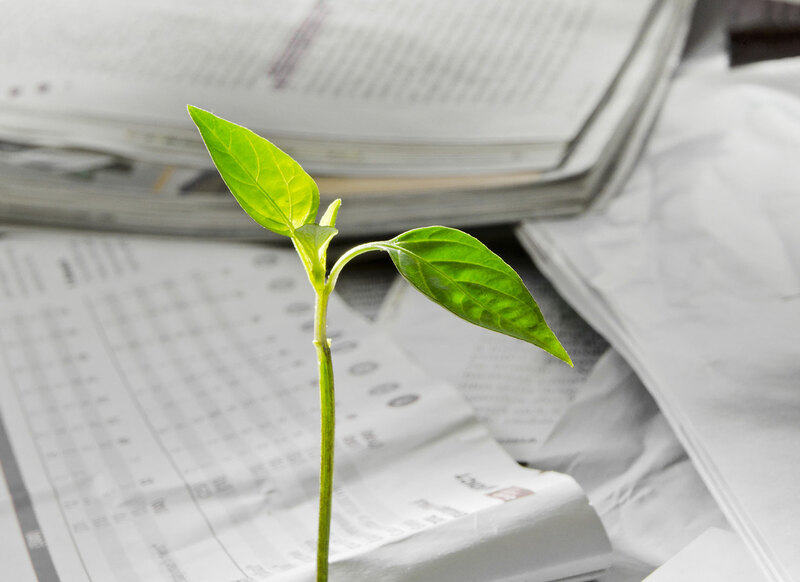 So place a small plant next to your desk scanner and feel extra productive.